According to a recent study by the Financial Industry Regulatory Authority (FINRA), 65% of Hoosiers lack the fundamental level of financial knowledge they need to make careful decisions about their finances. To help increase these skills, the Financial Stability Alliance for South Central Indiana and United Way are joining together again to sponsor Monroe County Money Smart Week. Money Smart Week starts on October 22. The week raises awareness of local financial stability resources and helps people improve their money management skills. These local Money Smart Week activities expand on the nationwide campaign held each year to help consumers strengthen their personal finances. Money Smart Week events address important topics for people at any stage of life and financial means. Whether curious about credit scores or ways to stretch budgets further, this week full of events is sure to have something for everyone. Programs will help individuals learn more about money and how to manage it, with opportunities to talk with experts about investments and retirement, making healthy financial decisions, reducing utility bills through home winterization, monitoring credit, being a smart renter, budgeting and more. 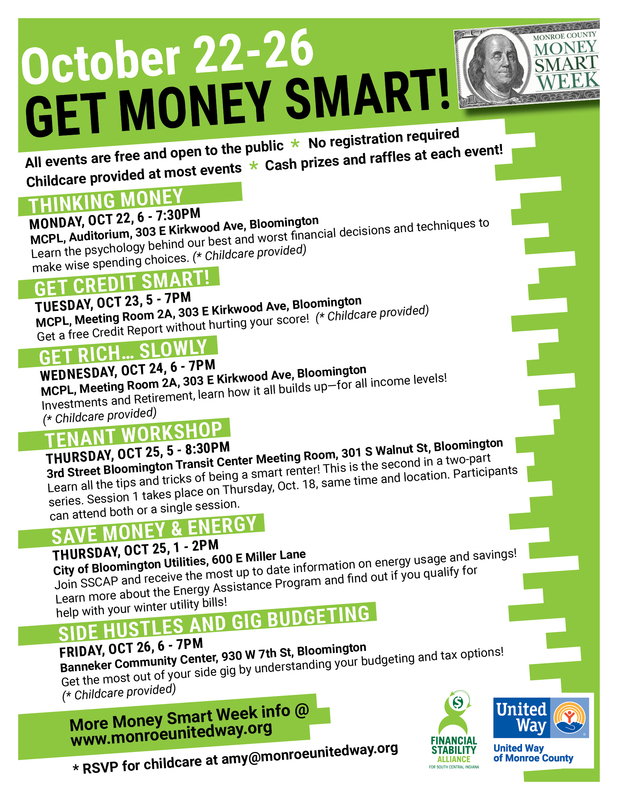 All Money Smart Week programs are free and open to the public. No registration is required. Childcare is provided at most events. Please RSVP for childcare to amy@monroeunitedway.org. Be sure to take this opportunity to learn to better manage your money now and plan for a financially stable future. Do you have your health care plan for 2019? Enroll Nov. 1 -Dec 15, 2018. All events are free and open to the public; no registration required. Thinking Money: What's Behind Your Spending Choices? Learn the psychology behind your best and worst financial decisions and techniques to make wise spending choices. Get a free Credit Report without hurting your score! Walk-in, and talk over the details with our knowledgeable volunteers. Investments and Retirement, learn how it all builds up -- for all income levels! Learn all the tips and tricks of being a smart renter! This is the second in a two-part series. Session 1 takes place on Thursday, Oct. 18, same time and location. Participants can attend both or a single session. Join SCCAP and receive the most up to date information on energy usage and savings! Learn more about the Energy Assistance Program and find out if you qualify for help with your utility bills! Get the most out of your side gig by understanding your budgeting and tax options! Monroe County Money Smart Week is a partnership between the Financial Stability Alliance for South Central Indiana and United Way of Monroe County. Want to learn more about the other building blocks for a good life? Visit Education and Essentials to see how we are making an impact.